We know the military puts very specific demands on its cargo. Cases-Cases has over 15 years of experience designing custom case solutions specific to the needs of the military. We can assist with all your case needs – from adherence to MIL specs to stackability for transport. We design cushioning systems with the end product and user in mind. We also design our cases to keep your equipment and items as secure as possible. We understand you need your cases quickly, with on-time delivery. Our staff of engineers can help navigate you through the case design process with ease and can work with you on any technical issues. Cases-Cases offers the best-in-class family of rotationally molded, injection molded, composite, and aluminum shipping cases for Military, Government, and Homeland Security applications. 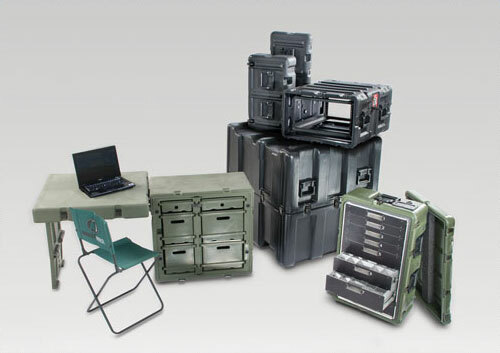 Our shipping cases, rackmount transit cases, and deployable weapons cases provide safe, secure shipping and storage of your valuable equipment: satellite systems, C4 systems, robotics, UAVs, and deployable armory equipment. We work with all types of cushioning systems from foam to shock mounted decks and racks. Your equipment will arrive safely within the rigid demands of government and defense contracts. If your program requires several different cases, and/or a requirement for Kanban or Just-In-Time (JIT) solutions, we have processes in place to solve these issues and make sure your project runs smoothly.